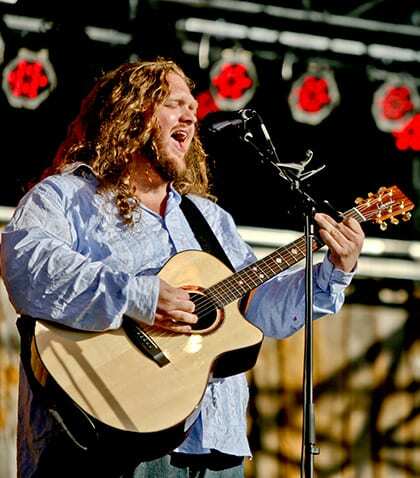 Matt Andersen…a powerhouse performer with a giant soul-filled voice and commanding stage presence, has built a formidable following the old fashioned way – through word of mouth. With over 2 million views on YouTube, independent album sales of over 30,000, a 2013 European Blues Award, three Maple Blues Awards in 2012 and winning Best Solo Performer at the Memphis Blues Challenge in 2010, it appears the entire world is discovering Matt Andersen. In a year, Andersen plays at least 200 shows. His extensive discography boasts seven albums, including one Christmas album, one live album, and two albums with harmonica player Mike Stevens. With his most recent album, Weightless, his debut album with True North Records, Matt shifts his formidable talents as a blues performer to his song-craft. The album features songs co-written with a number of accomplished songwriters … “They’re all people I’d hang around with outside of music, so it’s more friends just doing what friends do,” says Andersen, who adds that he didn’t feel any pressure on his first fully supported international release. “It was nice and relaxed, a great way to write. If I write a whole album by myself it sounds like me too much, where every song sounds the same, and I’m always leery of that. “It keeps it fresh for me; every tune has its own personality, which I really like. I realize I write better when I write with someone, it keeps you from settling for a lyric. I go that extra mile. Going back and forth with these people, we get the best out of the idea we could.” After hearing the instant classic material on Weightless, it’s hard to imagine any fan of Matt Andersen—old or new—leaving unsatisfied. Deep Roots Music Festival audiences can look forward to a very satisfying Thursday night show! You won’t want to miss this.